An interview with Dog World about agility... what else? 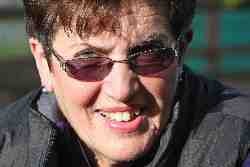 Ellen Rocco doesn't usually give interviews because she thinks that the focus should be on Agilitynet and not her. So when the Editor of Companion Dog World asked her to do a Q & A for the Winter supplement, she surprised herself by saying 'yes.' Here she talks to Rebecca Durrant about how Agilitynet was started, how beginners can get into dog agility and how one day she hopes it will be recognised as an Olympic sport. RD: When did you first become involved with agility and what drew you to the sport? ER: I'd had a very naughty (but nice) Standard Poodle who would not come when called and so when I got another dog I was determined this would not happen again. I went to a pet dog training class and we were quickly promoted to the top class. Being a Poodle, however, my dog was bored with the usual sit, down, stay routine so I asked my trainer Kevin McNicholas if he could suggest something else that we could do together. And the rest is history. I started a beginners' class at Trent Park DAC (Enfield) and never looked back. I swore that I would never compete and here I am 14 years later with a young, high drive Collie, starting all over again - and loving it. RD: What do you and your dogs most enjoy about agility? ER: The agility motto is 'Agility is fun.' 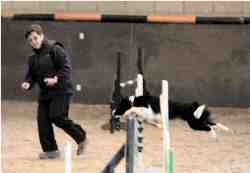 I really like the bond between dog and handler and the challenge of getting it right. No two agility courses are the same and so there are always things to learn. A bonus is that agility people are very friendly. Another good thing about agility is that it can be for people of all ages. I've seen six-year-olds in the ring as well as 82- year-olds. Not everyone can qualify for Crufts but anyone can have a nice day out with their dog and have a chance to come away with a rosette (clear round or place). The dogs like the exercise, the excitement and the treats! It's a lot of fun for both dog and handler. 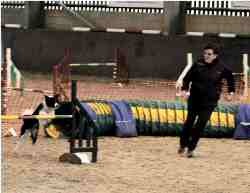 RD: Which types of dog are most suited to agility? ER: Any dog can do agility from the largest Great Dane to the smallest Chihuahua but the most popular (and successful) in the UK are the working breeds, particularly herding dogs like Border Collies and their crosses, Belgian Shepherds, Shelties and Kelpies, gundogs like working Cockers and Springer Spaniels and some of the more active companion dogs like Poodles, Papillons and Jack Russell Terriers. One cannot make generalisations and I know some very fast Westies and Beagles and some very slow Collies. The best ones have drive and a sense of humour! RD: What kinds of activity can a beginner expect to be doing in the first few weeks of training? ER: During the first few weeks of beginners' classes people are usually taught the basics - how to tackle the equipment safely. These days people are being taught lots of moves such as turns, crosses, pull throughs, serpentines etc, all of which were reserved for senior and advanced handlers in the old days. RD: How do I go about finding a reliable and well-run local agility group? ER: There are about 680 Kennel Club registered agility societies, clubs and training groups listed on Agilitynet. 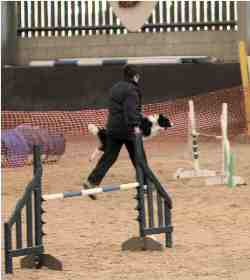 Quite a few pet dog trainers are adding agility to their classes for a bit of fun. I'd advise anyone wishing to start agility to get in touch with the club/group to see if it is okay to visit. Then go to the venue and watch. Clubs can be very different - some are very competitive and others very laid back. Some have a lot of Small and Medium dogs while others are primarily Collies. As there aren't all that many beginners' courses around it is worth signing up for an introductory class at a pet dog club just to get a taste of it and learn the equipment. Then if you like it, you can apply to an agility club. RD: What sort of equipment will I need to invest in initially and in general how expensive a sport is it? ER: For starters, be sure to wear comfortable clothes and have a good pair of trainers for running. Some good wet weather clothing is advised! The dog needs a quick release, snap-on collar, a good lead, lots of yummy treats and a favourite toy - preferably a tuggy or a ball on a rope as opposed to a squeaky toy which could set off the other dogs. As for the agility equipment, best to make sure you like agility before investing in too much. I advise people to start out with the basics like three to four jumps, rigid (tube) tunnel and weaves (stick in the ground will do.) With those obstacles, you can do a small course and have a lot of fun with your dog. RD: How does the health and well-being of an agility dog differ from a non-agility dog? ER: Agility people consider their dogs to be canine athletes. They are super aware of their dog's health and fitness. A limp will send an agility handler running to the vet. Handlers will, for the most part, not run them if the dog is overweight or has anything wrong with it without checking with a vet. Many agility people use alternative therapies like homoeopathy, chiropractic, osteopathy and canine massage to treat their dogs. Overall vets say that agility dogs are in very good health. RD: I understand you established www.agilitynet.co.uk in 1998. Please can you tell me more about what the web site aims to do. ER: I set up Agilitynet 12 years ago to act as a hub for all things agility. My background was in print directories and I wanted to set up a national website. That was before most dog people had computers. 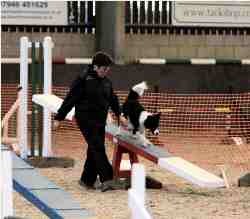 Agility was very parochial. Clubs and shows were local and no one was really aware that agility was played all over the world. At that time, the general public did not know the word ‘agility.' People thought it had to do with being flexible. Now agility in one form or another can be seen on TV or in the media, is mentioned in books and most people know what you mean when you say you do dog agility. I am proud that Agilitynet has been instrumental in pulling together the agility community via the internet, improving training techniques and promoting good practice in the sport. It is a source of news as well as information whether it be about a show cancellation or training workshop. It has also created an agility market so there are now top handlers who make their living teaching agility, equipment manufacturers and a selection of training aids such as books, DVDs and videos for sale. RD: What developments would you like to see in the sport in the UK during the next five to ten years and how can these things be achieved? ER: I'd like to see the continued growth of the sport and see it recognised by the Sports Council as a ‘sport' as opposed to a hobby or activity so clubs and groups qualify for Lottery Funding etc and can be included in events like the Olympics and Sports' Personality of the Year. Did you know we have a double gold winning World Champion in our own Natasha Wise who has grown up in the sport and competes at the highest standard? RD: Please can you explain how people and their dogs can progress up the ladder in the field of agility, from the most basic of levels to the highest? Personally I think they are one and the same thing. I like to teach the ‘right way' of doing things but don't care if people compete or not. Shows are the place where one tests oneself. You are always competing against yourself first and the other competitors second. All handlers start at the beginning. In KC jargon, it's called Grade 1 and Beginners in others but the criteria are the same. Handlers must win out of Grade 1 or Grade 2 etc or collect enough points to move up. Experienced handlers with new dogs who have ‘won out' start at Grade 3. The most advanced handlers compete in Grade 7 and Championship classes. Agility is now played all around the world. Some things may be different but for the most part, international agility is based on British rules. The Agility European Open Championships are going to be hosted by Britain in 2012 – the first FCI approved agility event ever to come to this country.